More Things You Should KNOW! When I was a kid there was this joke floating around. (I guess that would make it an old joke!) Question: Why does a cemetery always have a fence around it? Answer: Because people are dying to get in there!. I suppose that is true to some extent, but this is absolutely true about everyone who is buried there: They are not committing any sins! It is impossible to sin if you are dead, and this is the point the Apostle Paul is making. Yesterday we saw that God sees us as dead to sin because our old man has been crucified. Here is the kicker: Crucifixion is probably the most excruciatingly painful and slowest death ever to be conceived by man. For the most part, humanity has a will to live that is extremely strong and the old sin nature will not go down easily and it can be very painful. Yet when we consider the pain that the OSN has caused us, don't you think it is time? Paul goes on to tell us the hope (confident expectation) that lies ahead. As Believers in Christ we are identified with everything about Him. He has been resurrected to live anew...and so have we! "Dominion" literally means "lord it over". Before Jesus was crucified, there were times when the Pharisees wanted to kill Him...but it was not the right time, nor the right way. Just before His crucifixion, they didn't want it happen at that time as it might cause an uproar of the people because of the High Sabbaths, yet there was nothing going to stop it. Death "lorded it over" Him until the appointed time. 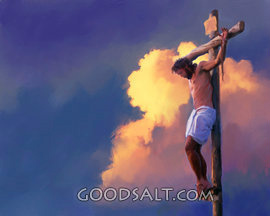 He should have died from the scourging, yet He lived...in order for Him to die for the sins of mankind. The reason for His incarnation. He has died once and that is the only time, His mission was completed, NOT at His death, but rather at His resurrection! Our salvation and Hope is complete! When we read the Gospels, we find Jesus often saying, "Verily, verily I say unto you..." When He says that, you really need to pay attention. At his point, I am going to throw a "verily, verily" at you! "He died unto sin once." This is so important to understand, that it bears repeating. Jesus died for sin ONCE! He paid it all..completely. Every sin that ever has or ever will be committed has been paid in full by His work at Calvary's Cross. Sin therefore, is not the issue in salvation. It is simple. Jesus is the the only One who stands between us and eternal life. If there were a sin that would keep us out of Heaven, then that would mean that Jesus did not pay for that particular sin. He has died ONCE and for all. That was enough! He died for us, He now lives for God (the Father). And we should too!